In the case of Herd Chiropractic v. State Farm, 2011 PA Super. 178 (Pa.Super. Aug. 23, 2011 Panella, Lazarus, and Ott, JJ. )(Opinion by Lazarus, J. ), the Pennsylvania Superior Court affirmed a Dauphin County trial court decision that an insurance company may be still be liable for attorney’s fees under the First Party Medical Benefits Statute, 75 Pa.C.S. § 1797, even when the carrier properly invokes the peer review process. In Herd Chiropractic v. State Farm, the medical provider provided various chiropractic services to a State Farm insured. State Farm requested a peer review to assess the reasonableness and necessity of the treatment. The peer review doctor opined that the treatment rendered by the chiropractor beyond a certain date was not reasonable and necessary. Accordingly, State Farm advised the chiropractor that it would not be paying for any additional treatment. 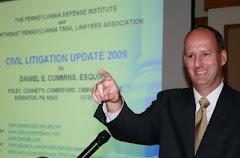 The chiropractor filed suit in the Court of Common Pleas of Dauphin County, Pennsylvania under Section 1797 of the MVFRL demanding payment of the unpaid chiropractic bills plus attorney’s fees and treble damages. The matter proceeded to trial non-jury before the Honorable Bruce Bratton in July 2009. In December 2009, Judge Bratton found in favor of the chiropractor and awarded it $1,380.68 in compensatory damages for the outstanding amount of the bills, plus 1 % interest. State Farm appealed and the Superior Court affirmed. In its Opinion, the Superior Court found no error in the trial court’s decision that State Farm had properly adhered to the peer review procedure. However, the Superior Court also agreed with the trial court’s decision that, although the carrier adhered to proper procedure, that did not preclude an award of attorney’s fees where the court determined that the care provided was indeed medically necessary. The Superior Court's decision can be viewed online HERE.